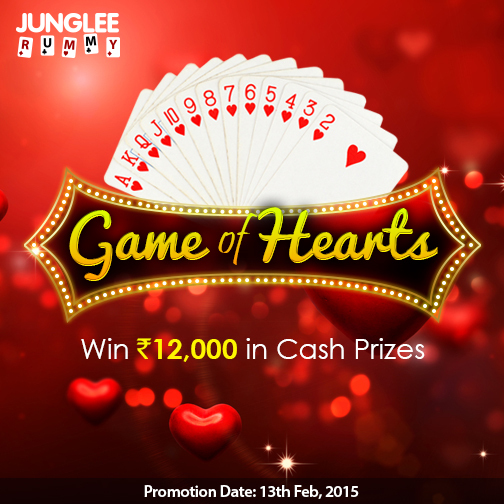 Junglee Rummy has brought a new challenge for all online rummy players this Valentine’s Day. Complete the challenge and win Rs.12,000 in cash prizes. Join the Game of Hearts and show you have got love for the game of rummy by completing the challenge. Junglee Rummy Game of Hearts promotion will test your rummy skills against best rummy players. You have to win the game with two pure sequences of Heart suited cards to complete the challenge and claim the cash prize. The first 40 players who completes this challenge in the promotion period of one day can grab the pool prize of Rs.12,000. The promotion will start on 13th Feb 2015 at 00:01 hours and will close on the same day at 23:59 hours. You have got 24 hours to prove your rummy skills. This rummy challenge is only applicable on 13 Card Point Rummy games of Rs.40 above. Also, you are not allowed to use Jokers to form your sequences unless you have Heart suited Jokers. After you have successfully completed the challenge, do mail your game id to support@jungleerummy.com to avail you cash prizes. Once your game is checked and verified, the Junglee Rummy support team will credit your account with Rs.300. If you are a new player, you can also claim Rs.25 Free from Junglee Rummy for joining them. To know more about more promotions and bonus packages, please visit our New and Promotions page.